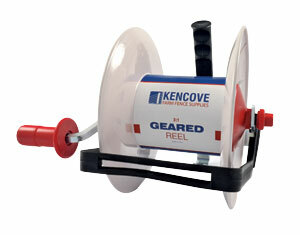 The Kencove Geared Reel has a 3:1 ratio, which means for each turn of the handle, the bobbin spins 3 times. When rewinding long lengths of twine or ribbon, the extra cost of the geared real is a worthwhile, time-saving investment. To electrify the polywire, simply use a 4' Jumper Lead (MPC). Attach one clip to the electrified perimeter fence wire and the other to the metal loop on the side of the reel.